In Part 1 of this series we discussed the role of NOD’s biochemistry laboratory in the development of a miticide. 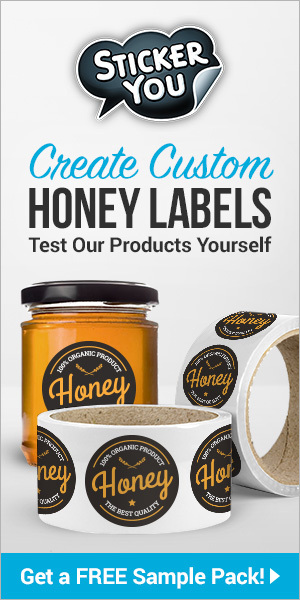 Once a test biopesticide formulation is developed and passes through the initial screening processes in the lab, then the next three questions are what do the bees think of it, how well does it work, and what about residues in the honey? 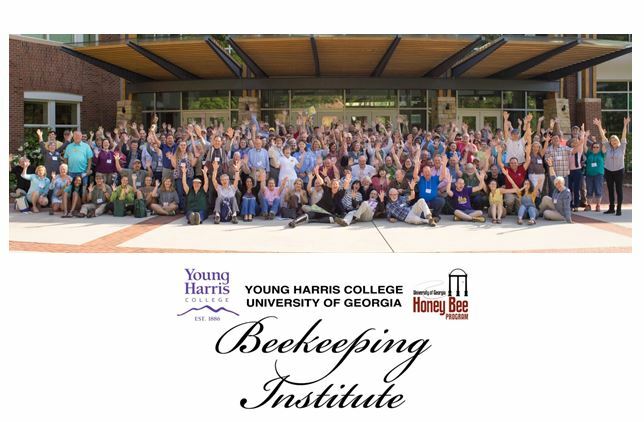 It is time to go out into the field to conduct in-hive studies with the bees! There are four key factors that needed to be determined when setting contraints on the use of a miticide: functional dosage, optimal environmental condition range, product placement in the hive and treatment periods. 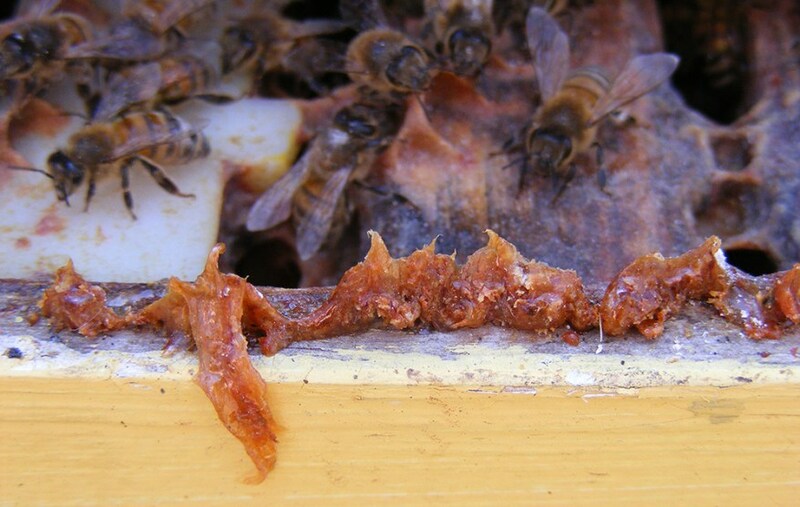 We already know that Varroa, tracheal and tropilaelaps mites are more susceptible to formic acid vapors than the honey bee colony is, which is why we can use it as a miticide. But how much is needed, and how much is too much? To determine functional dosage in the field we made up small packets of the formic acid saccharide gel in the wicking material and started applying them in a series of hives. For examples, see the series of photos, starting with a single packet in the heart of the brood rearing zone, and going up to 12 packets. 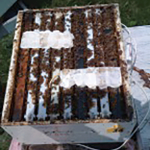 Colony response and Varroa mite mortality was monitored for the series of hives in each group. Results: A single packet had little effect, a significant positive effect was observed at three packets, and no additional beneficial effects were observed after six packets. Now that dosage had been determined, we could refine the presentation of the technology into formulated strips: one strip = three packets. An optimal, single application full dose treatment is two strips, laid centrally across the frames in the heart of the brood rearing zone of the hive. 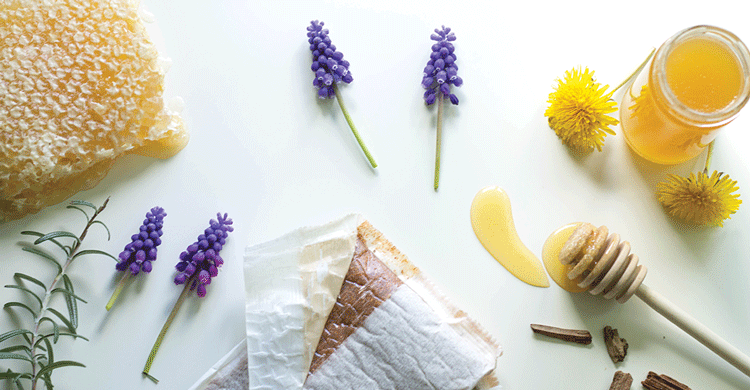 Beekeepers need to know the environmental conditions under which they can apply the product: How hot can it be? How cold? 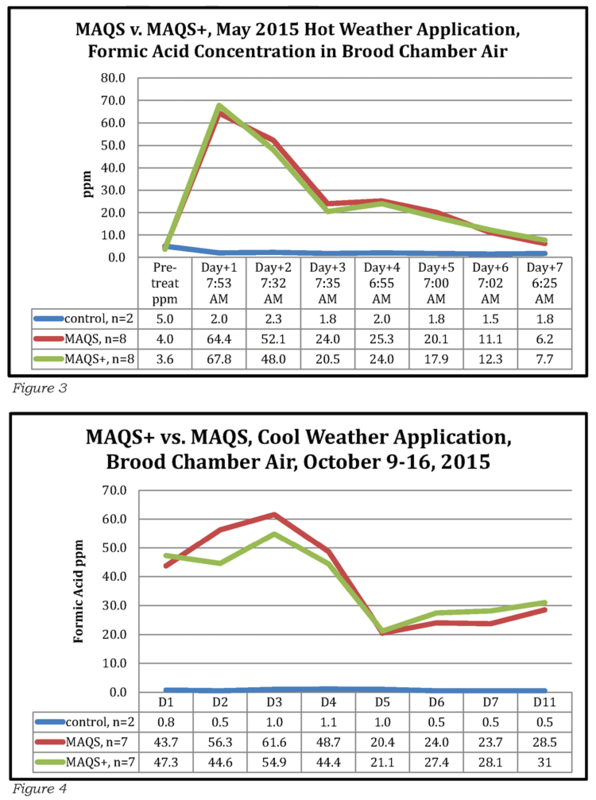 Is humidity a factor? Fortunately, we could turn to the bees for guidance, but will start by looking for weaknesses of the pest. Targeting the Varroa Where They Reproduce. 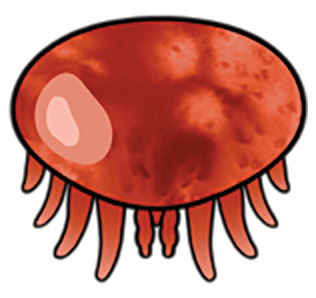 Varroa mites are arthropods.3 The female Varroa develops its hard, dark red chitin shell in its final moult, preparing it for the world outside of the brood cell, whereas the male Varroa just lives long enough to mate with his sisters in the brood cell where it is born; it does not develop the hard chitin shell, so are a softer target. 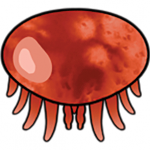 After the brood cell is capped it takes the male Varroa over 10 days to reach sexual maturity, so in worker brood there is only a few hours during which mating can successfully take place before the adult bee emerges. As long as the males can be significantly damaged or killed before they reached sexual maturity, even if their siblings survive treatment, the next generation will be unable to reproduce. With this in mind, NOD wanted to work with the bees, to harness their social abilities to incubate the brood rearing zone and to move air through the brood chamber. Additionally, we noted that honey bees cluster at ~50ºF, so, to minimize disruption to colony activities we saw a desirability to apply the product above that temperature. 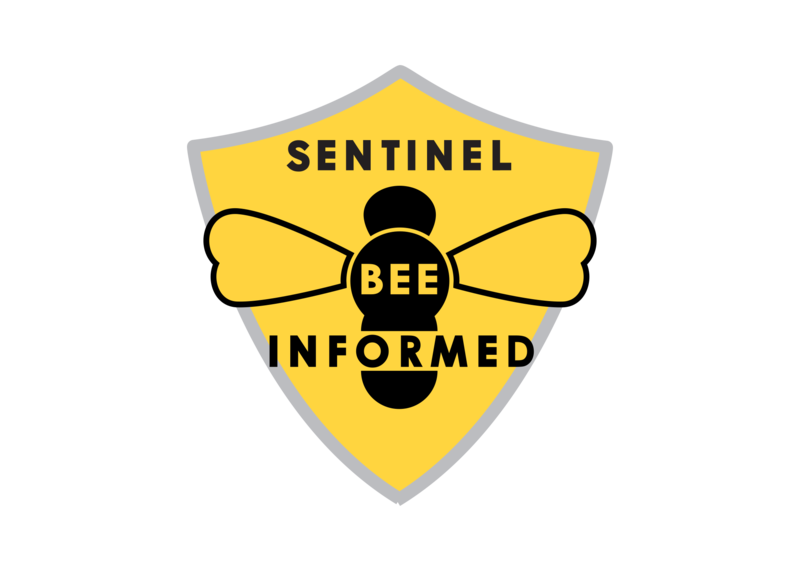 Once the product is applied, lower temperatures, day or night, are not a concern because of the temperature maintained by the bees in the brood rearing zone. The bees maintain an incubation temperature in the brood rearing zone of ~95°F (35ºC), and keep the environment humid to keep the larva from drying out. Initial tests indicated that the product could be safely applied at ambient temperatures up to 92°F (33ºC) in the beeyard; subsequent experience provided information that under 86°F (30ºC) provoked less of a negative colony response, so an upper temperature limit for the day of application was set at 85°F (29.5ºC), along with precautionary statements for the first two days of treatment. 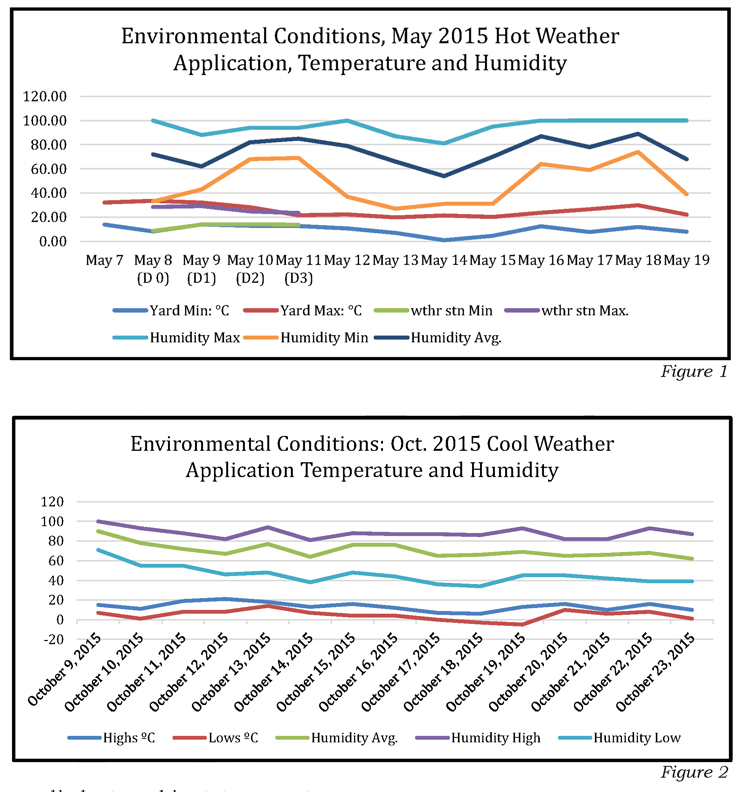 For confirming the temperature ranges for Formic Pro™, two studies were conducted. The temperature and humidity charts are Fig. 1 and Fig. 2. How much formic acid vapor is required to kill Varroa? A review of the literature indicates that the minimum concentration of formic acid required to cause mortality to Varroa has been determined to be >19 parts per million (ppm) over an extended period of time.4 NOD decided to set 20 ppm within the brood rearing zone as its target baseline. The bees can vent out amounts that are above their comfort level as long as the hive entrance is fully open. Testing the concentration of formic acid in the brood rearing zone air became part of our studies. 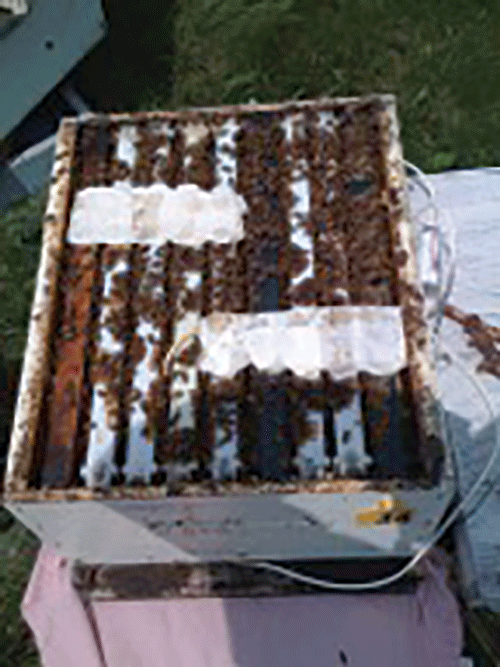 Using calibrated air sampling tubes, research technicians are able to draw air out of the brood rearing zone of a hive and determine the level of formic acid present. Naturally we wanted to know the concentrations at the extremes of the temperature limits previously discussed, so set up studies to find out. The results can be seen in Fig. 3 and Fig. 4. Under hot weather conditions the strips were considered spent by Day 7, due to the bees performing rapid air exchange during such weather conditions. Under cooler weather conditions the strips remained active several days longer. Please note that Beta names are assigned to the test products. 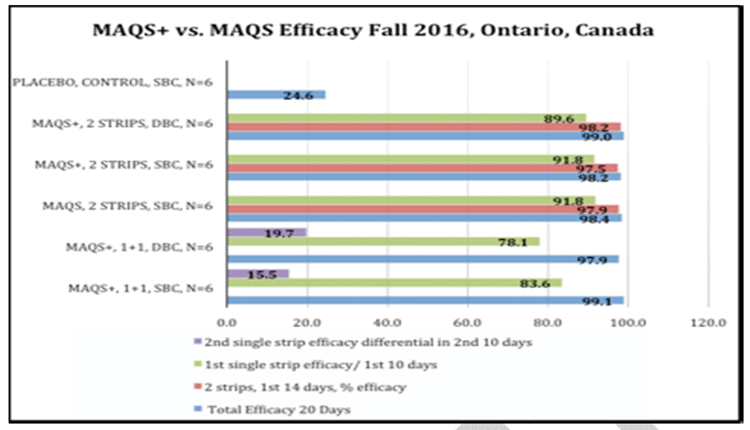 MAQS is the product first registered in 2011 (Mite Away Quick Strips™), the test product is referred to as MAQS-ESL or MAQS+; the trade name for the final version registered in the U.S. is Formic Pro™. Now we have determined that the NOD developed strip technology releases adequate amounts of formic acid vapor over an extended period of time, lets take a look at the efficacy using internationally accepted methods. To determine efficacy we follow the study guidelines established in the European Union.5 We outfit the hives with bottom boards that have removable drawers to accommodate an inserted sticky board. We treat with the test product as per a research study label, then, after the completion of a brood cycle, we treat with a proven product with a different active ingredient. Because we have relied on formic acid since 2002, and resistance to Fluvalinate had not shown up in colonies being tested, we are able to use Apistan® as the critical treatment. Good science is a lot of work! In the study conducted in the fall of 2016, from 36 colonies kept in three locations 97,028 mites were collected on over 400 sticky boards. Many hours go into just prepping the sticky boards. We outsource mite counting to third-party temporary workers that work for many hours under bright lights through magnification lenses. Once counted, the results are tabulated. Fig. 5 is the efficacy data from the Fall 2016 study. Once our initial field studies were completed in 2014 we started to release some product to third-party field testers and researchers, wanting their feedback. We wish to send a heart-felt thank-you to all of the collaborators that field tested the beta extended shelf life strips and gave us their feedback in 2015 and 2016. In response to the feedback we focused on fine tuning the manufacturing process to ensure that the gel extrusion was compressed out to better fill the Ecopaper wrap, thereby expanding and enhancing the gel-to-wick contact area, thus increasing the efficacy of Formic Pro to over 95% efficacy, in line with Mite Away Quick Strips. To minimize the symptoms of varroosis, for most regions we recommend that colonies be treated in the spring to protect the summer bees that will be going into the honey flow, and to treat again early in late Summer to protect the bees that will become the Winter cluster. Additional treatments may be required in warm regions where colonies rear brood most of the year. Missing a treatment or treating too late can lead to irreversible colony decline, so it is important to monitor the Varroa mite levels in your hives so treatments can be applied in a timely manner. That’s it for this month. 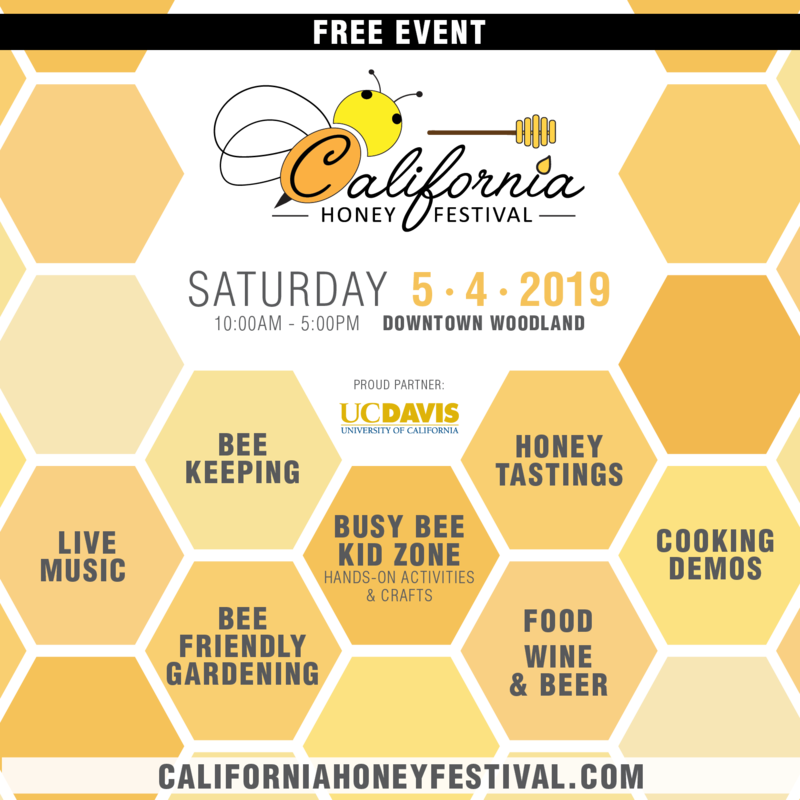 In Part 3 we will look at the impact of treatment with Formic Pro on the formic acid and total free acid levels in honey, and take a look at the registration process required to be able to make a product available in the marketplace. 515 November 2010 EMA/CVMP/EWP/459883/2008 Committee for Medicinal Products for Veterinary Use (CVMP) Guideline on veterinary medicinal products controlling Varroa destructor parasitosis in bee.